What with centenary commemorations marking the beginning of the First World War in 1914 and it being 25 years since the Berlin Wall fell, we are at risk of becoming exhausted from historical anniversaries this year. But as a proud Bristolian now living in exile in London, I would like to propose just one more date that is worthy of celebrating, namely 2014 being the 150th anniversary of the Clifton Suspension Bridge. 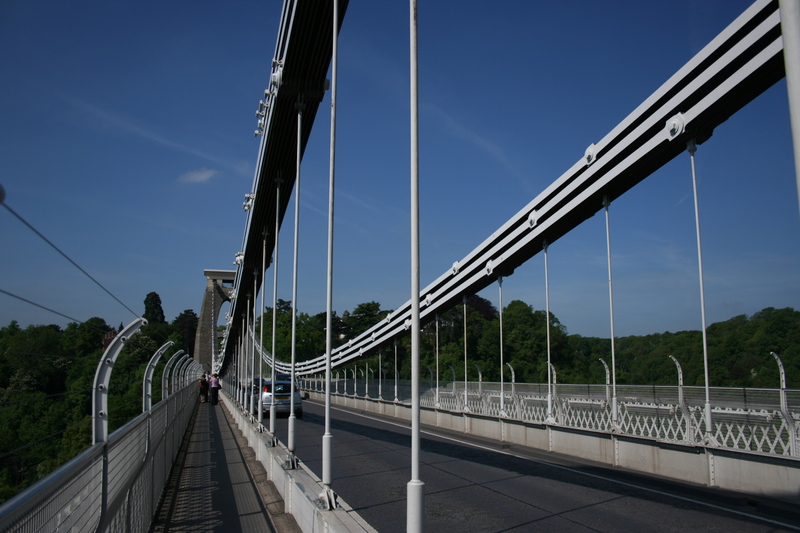 Elegantly spanning the Avon Gorge, this fantastic landmark designed by the great engineer Isambard Kingdom Brunel is for a good number of people the city’s most recognisable landmark. Many an artist has captured this amazing feat of engineering on canvas and it’s the picture postcard image of Bristol that tourists send to friends around the world. To help mark this important anniversary, organisers are planning “the biggest and most extravagant firework display Bristol has ever seen,” according the city’s local paper. More than 100,000 people are expected to gather in and around Avon Gorge for the 15 minute display in December. The city owes an enormous debt to Brunel; he was influential in establishing a rail network between, amongst other places, Bristol and London. He built two of his famous steamships here, including the SS Great Britain which was returned to the city in 1970s to a hero’s welcome and is now a popular tourist attraction. Brunel was also involved in lots of other smaller schemes in Bristol, including repairs to the Cumberland basin and contributed to enhancing waterworks. If you widen the study to the whole country, there would be enough to fill an encyclopaedia. Brunel arrived in Bristol to convalesce from an accident while constructing the Thames Tunnel, where he had risen to become chief engineer after his father (Marc) became unwell, and heard there was competition to design a bridge to span the Avon Gorge. Merchant William Vick, had left £1,000 in his will in 1753 for such a project, noting that a total of £10,000 had to be raised before the money could be touched. Eventually in 1829 the legacy had reached £8,000 and a subscription fund was launched to raise the remainder of the money. Brunel, aged 24 at the time, was declared the winner of the second round and a lavish ceremony was held to mark the beginning of the bridge’s construction. After a public breakfast at the Bath Hotel, down by the gorge Champagne was drunk, the Dragoon Guards played the National Anthem and speeches were held, including one from Sir Abraham Elton. But after just three months, the dramatic events of the 1831 Bristol Riots soon put a stop to work as investment dried up. 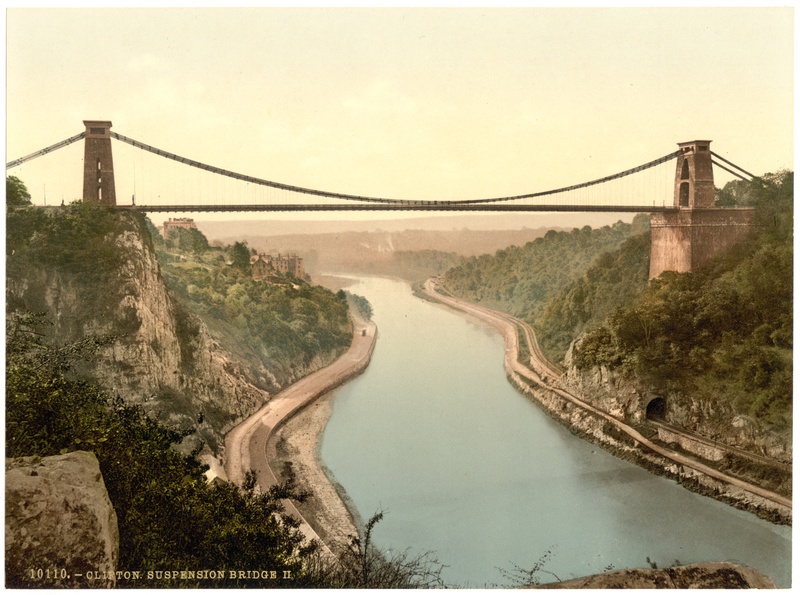 More false starts came; the foundation stone was laid in 1836 and Brunel could not resist the chance to ride across the gorge in a basket on an iron bar which had been intended to carry materials from one side to the other. His workers had done had some fun – which had initially annoyed him – and he thought he would do the same, although his pregnant wife turned down the opportunity to join him. Unfortunately when Brunel attempted to cross in the basket it jammed and workmen, his wife and the crowd that had gathered watched anxiously as he climbed the suspension bridge rope and unlocked the jammed roller. Two hundred feet above the river, it was a daring manoeuvre. A few weeks later a couple who had just got married decided to embark on the same adventure, but unfortunately they also got stuck and had to wait until workers were able to rescue them. Work slowly begun again and the bridge piers were completed, but then in 1842 the money dried up entirely and the Clifton Suspension Bridge went bankrupt. The trustees resurrected the basket crossing attraction in attempt to raise vital funds for the project, but the £125 in receipts was nowhere near the £30,000 required. Brunel would never get to see the bridge completed and for years the stone towers stood as white elephants on either side of the gorge. The project’s financial problems would have come as a disappointment for Brunel, but all was not lost. Through winning the competition, he had made a name for himself in Bristol and it brought him to the attention of the people who held the key to investment in the city, the Merchant Venturers. Soon he had backers for projects in everything from trains to steam ships. Although not everyone was complimentary about his work at the time (and in recent years there have been claims that he didn’t actually design all the projects he said he did), it was this relationship with the Merchant Venturers and others that made Brunel so famous. As for the Clifton Suspension Bridge, it was finally opened in 1864, some five years after Brunel’s death. At 10am on December 8th a packed procession left the centre of Bristol with five army regiments, a Royal Navy band and most major organisations in the city were represented. Crowds gathered in the Avon Gorge to watch the proceedings. Then at 12 noon field guns fired their salute and the first dignitaries crossed the bridge – which had been decorated with flowers – to Leigh Woods. One hundred and fifty years on, Bristol is getting ready to celebrate an amazing wonder of the world again.